Staircase on Lilac, Los Angeles, 2018. 40”x30”, Limited Edition of 2. Archival Pigment Print, Hahnemuhle Fine Art Paper. Tree House, Guerneville, CA, 2018. 24” x 18”, Limited Edition of 5. Archival Pigment Print, Hahnemuhle Fine Art Paper. Fog on Eastern Ave, Guerneville, CA, 2018. 24” x 18”, Limited Edition of 5. Archival Pigment Print, Hahnemuhle Fine Art Paper. Dog House, Guerneville, CA, 2018. 40” x 30”, Limited Edition of 2. Archival Pigment Print, Hahnemuhle Fine Art Paper. Mercedes, Guerneville, CA, 2018. 40” x 30”, Limited Edition of 2. Archival Pigment Print, Hahnemuhle Fine Art Paper. View down Eastern Ave, Guerneville, CA, 2018. 24” x 32”, Limited Edition of 3. Archival Pigment Print, Hahnemuhle Fine Art Paper. Airstream, Guerneville, CA, 2018. 32” x 24”, Limited Edition of 3. Archival Pigment Print, Hahnemuhle Fine Art Paper. View from MacBeth St. #1, Los Angeles, 2018. 40” x 30”, Limited Edition of 2. Archival Pigment Print, Hahnemuhle Fine Art Paper. View from MacBeth St. #2, Los Angeles, 2018. 24” x 18”, Limited Edition of 5. Archival Pigment Print, Hahnemuhle Fine Art Paper. 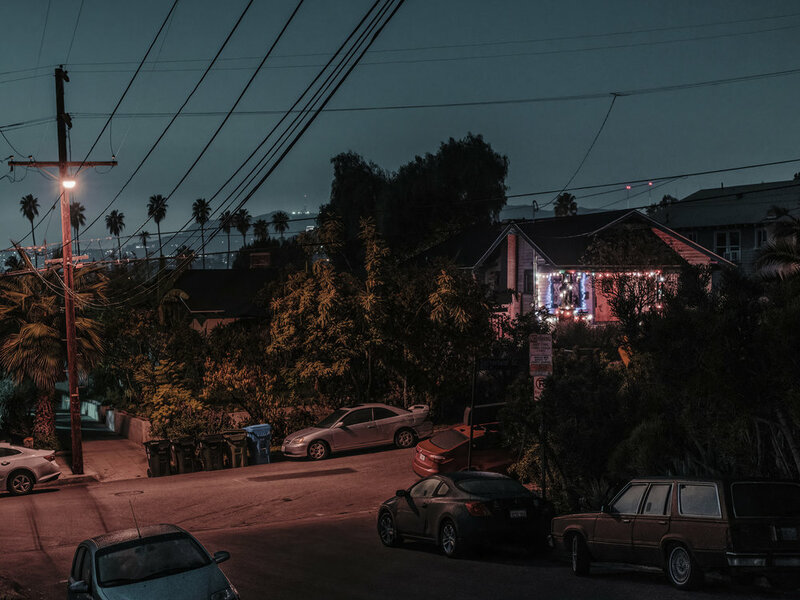 View from MacBeth St. #3, Los Angeles, 2018. 12” x 16”, Limited Edition of 9. Archival Pigment Print, Hahnemuhle Fine Art Paper. Palms from Rooftop Pool, Los Angeles, 2018. 24” x 32”, Limited Edition of 3. Archival Pigment Print, Hahnemuhle Fine Art Paper. Agave on Quintero St., Los Angeles, 2018. 40” x 30”, Limited Edition of 2. Archival Pigment Print, Hahnemuhle Fine Art Paper. House on Levetta and Scott, Los Angeles, 2018. 24” x 18”, Limited Edition of 5. Archival Pigment Print, Hahnemuhle Fine Art Paper. Shortstop Parking Lot, Los Angeles, 2018. 24” x 32”, Limited Edition of 5. Archival Pigment Print, Hahnemuhle Fine Art Paper.